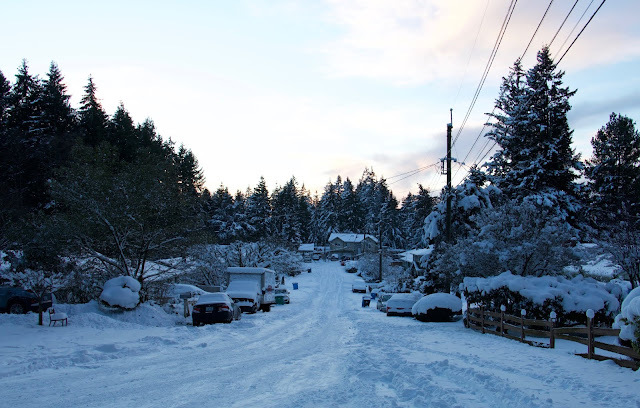 NE 194th St from 10th Ave NE (North City) February 9, 2019. Our Friday afternoon through Saturday morning snow storm brought Shoreline a new snow accumulation total of between 5 to 7 inches of snow. The winds with this storm caused snow drifts resulting in some spots getting more snow, other spots getting less snow, especially around buildings and trees. With the older 2 inches of snow left on the ground from the previous storm we probably have a total snow accumulation on the ground between 7-9 inches in most neighborhoods. Now for round three: The National Weather Service in Seattle has issued a Winter Storm Watch for areas including Shoreline and Lake Forest Park. The Winter Storm Watch is in effect from Sunday afternoon until late Tuesday night. I'm expecting this to turn into a Winter Weather Advisory for Sunday, and a Winter Storm Warning for Monday afternoon through Tuesday evening. The National Weather Service will release updates on this likely tomorrow morning. There are two back to back weather systems with the first one moving in Sunday afternoon. The first storm appears to be tracking south of us but close enough that we are expecting between 1 to 3 inches of new snow. The second storm system is moving in right behind the first one and is expected to be another widespread hit. We are expecting between 5 to 8 inches of new snow with the second storm Monday into Tuesday night. There is potential for the second storm to be bigger than the Friday evening - Saturday morning storm we just experienced. Bottom line: Total accumulation from the next two storms could be 6 to 11 inches of snow, on top of the 7-9 inches of snow we currently have. This could potentially put us at a total snow depth up to 20 inches by Tuesday night. Dare I mention that we have another storm possible Thursday or Friday? It's too early for details right now. Be sure to check back with www.shorelineweather.com current conditions and storm updates.